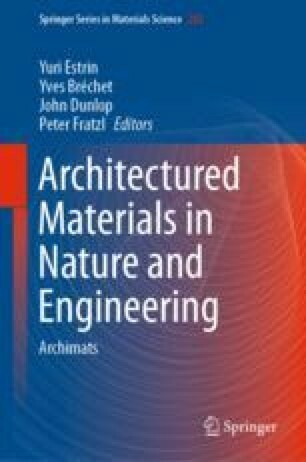 This chapter provides a framework for predicting buckling instabilities (global and local) in composite struts using a discretizing approach to divide the cross-section into finite regions or blocks (elements) with distinctive composition and material properties. This framework is applied to two compositing approaches: (1) an additive process, e.g. electrodeposition of nanocrystalline nickel (n-Ni) on steel or aluminum substrates creating a discrete interface, and (2) mass transport phenomena, e.g. gas carburization of steel microtrusses creating a continuous and gradual change in composition. The individual composite struts are prone to failure through inelastic/elastic global/local buckling instabilities due to their typically high slenderness ratio (for lightweight requirements). An optimal architecture is defined as the lightest architecture in the defined architectural space that can support a given load before failing; mathematically equivalent to satisfying the Kuhn-Tucker condition. For the electrodeposition example, the optimal trajectory was found to be dependent on the substrate material as well as the level of adhesion of the sleeve to the substrate. However, in the carburizing example, optimal architectures cannot be found using the same optimization approach due to the negligible weight penalty associated with the addition of carbon atoms (i.e. no trade-off between strength and mass). Other factors such as ductility and fracture toughness need to be addressed to find the optimal architectures.